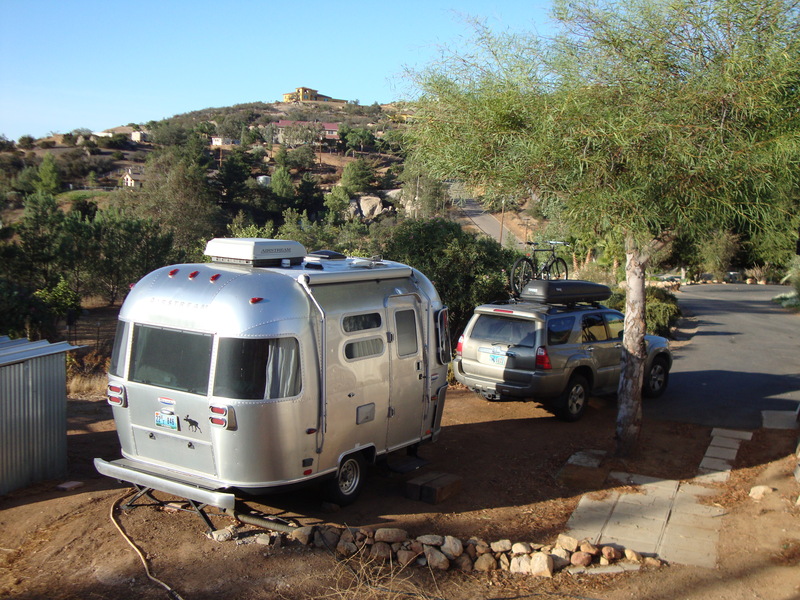 The Route: Steinbeck kicked it on Route 66 across Arizona to the Continental Divide in New Mexico where he camped. I had a speaking engagement at the Menaul School so I sailed I-8 from SanDiego to El Centro, and then State 78 and U.S 95 along the Colorado River to Needles, California. I pushed from Needles to Albuquerque, New Mexico in one long day on I-40. The Landscape: Crossing Arizona on I-40 is like attending an opera. Act one—the Western section builds to a dramatic Ponderosa Pine-covered crescendo at 7,300 feet in elevation at Flagstaff—with the snowcapped San Francisco Peaks as a backdrop. The third act drops down and gets a bit flat and bland with the occasional gaudy flourish in the form of a Navajo trading center, but the climax in Window Rock sends one away happy. New Mexico, the land of enchantment, delivered an enchanting, unseasonal and fortunately brief snowstorm. The distant red rock buttes were backlit through the snowy mist and pastel in color. Steinbeck allotted one paragraph to the state of Arizona in Travels with Charley. His only comment about Flagstaff, “…with its mountain peak behind it.” He stopped in New Mexico to evaluate, and concluded after a heart-to-heart with Charley that he had exceeded his ability to assimilate what he was seeing, and needed to rest and regroup. My guess is he was fighting his recurring battle with loneliness and depression. What I find most intriguing is to compare what I read in Travels with Charley with what was going on in Steinbeck’s life at the time of the trip. His departure was delayed for several days in September of 1960 because of Hurricane Donna. In the first few pages of Travels with Charley, Steinbeck describes saving his boat, the Fayre Eleyne. She was being shoved against a pier in a ninety-five mile-an-hour wind by other storm-driven boats and certain to be sunk. Steinbeck jumped into her and motored out to the middle of the bay to safe anchor. Then he dove into the water and swam to shore, fully clothed. Signs of another Charlie passing. Charlie & Bertha 4-Ever. Are there any more common and provocative metaphors in classic literature (not to mention popular culture) than storms and journeys? It seems every family has to weather their tempests, some of which rage in the middle of odysseys. 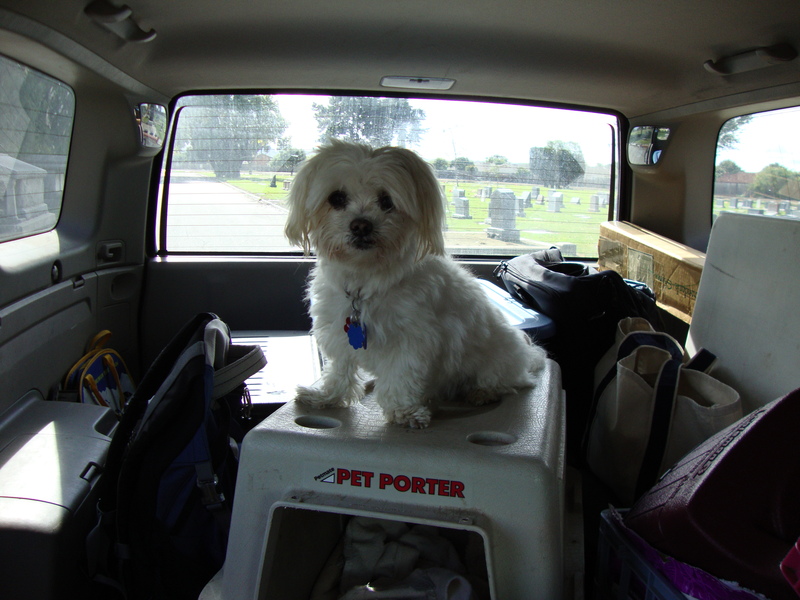 The Dog: Max had a nice break from the road and the confines of the car in Jamul, California at my brother’s home. 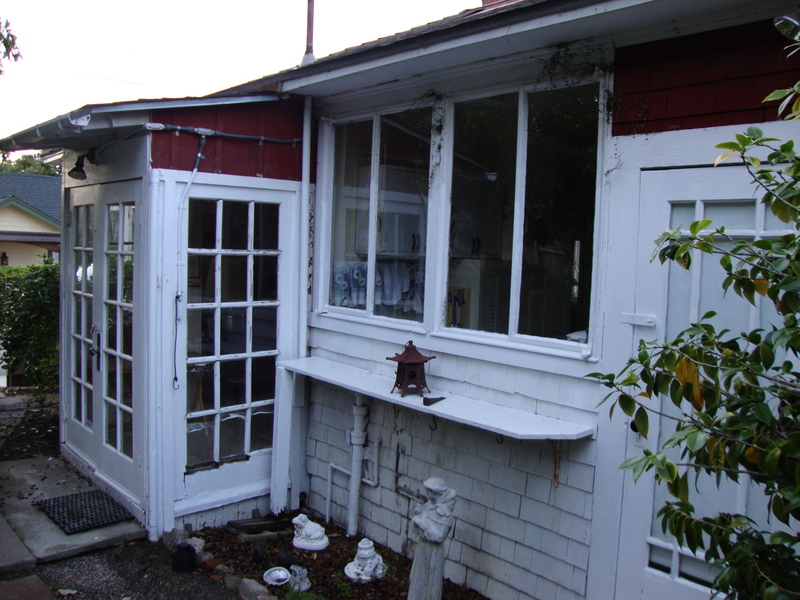 He had a shaded courtyard to himself. The Bambi named Winnie under the "Winnie Tree," planted for our mother, Winifred. Sweet Notes: Thanks are due to brother David and wife Lori for a much needed two-day break at their home in Jamul. A sweet note for the sweet kids at Menaul School in Albuquerque—you were wonderful, thank you for riding along. Thanks to Menaul School Head and pal, Lindsey, and Head’s Spouse-extraordinaire, Laurie for putting me up and for riding along. The Route: After a bittersweet visit to Salinas and Monterey Steinbeck wanted out of California by the quickest route. That according to his description in the book and my 1959 Rand McNally would have been U.S. 101 to Gilroy, state 152 to Chowchilla, U.S. 99 to Bakersfield, U.S. 466 to Barstow and Route 66 to Needles. I varied from this itinerary because of a desire to see Big Sur and the need to include Santa Barbara in my travels. From Gilroy, I hauled the Bambi down U.S. 1 all the way to Isla Vista where I camped at El Capitan State Beach north of Santa Barbara. The Landscape: Yes sir! Big Sur! Everything I imagined—squared—slamming surf, slanting rock, tall timber. Big Sur is a magical place. I was surprised at the topography south of it. Here the Santa Lucia Mountains pull back from the sea. 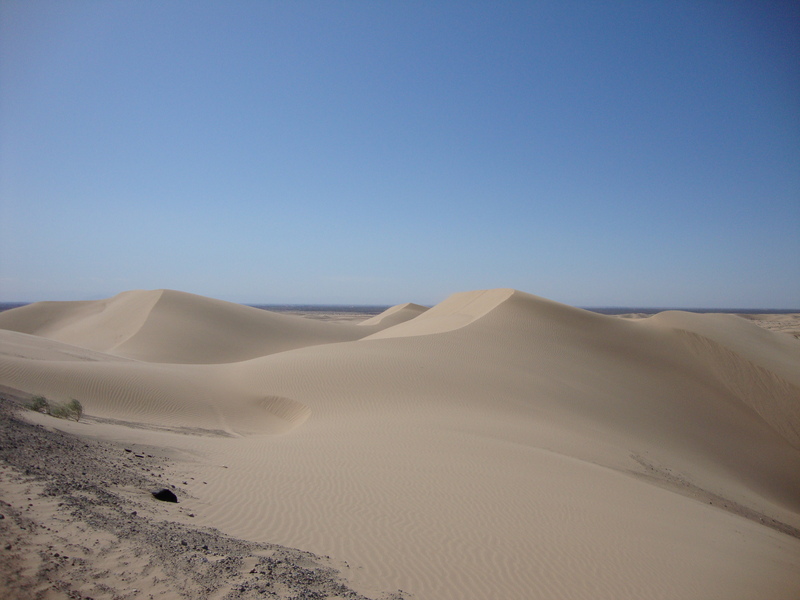 It was rolling and treeless and arid, a little like high desert on the coast. The zebra wandering unfettered on the Hearst property north of Cambria added to the exotic feel of the land. At one point, a car approaching from the south was inundated by waves arching over both lanes of the highway. 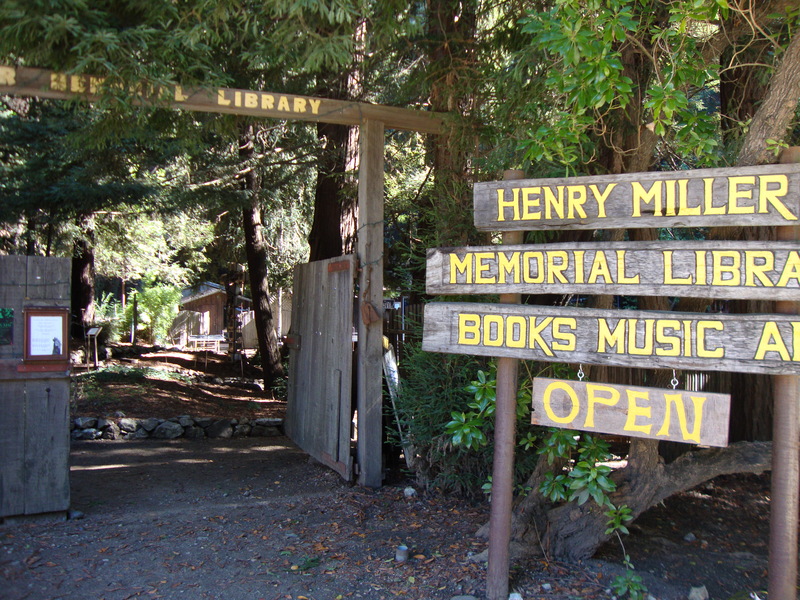 The Steinbeck Connection: Not far south of Carmel Highlands, I stopped at the Henry Miller Memorial Library, “where nothing happens.” I purchased two Steinbeck novels and chatted under the towering redwoods with Susanna Williams. Susanna’s grandmother was the first baby born in Jackson Hole (or so her relatives claim, she admitted to a family tendency to make a good yarn, better), her parents were beekeepers in Dillard, Georgia for a time and she attended college in Utah. When I told her all those places where fixed firmly in my peripatetic history she accused me of making it up. Then Susanna, red-haired and comely, pointed to her lip stud and said that she had her piercing done in San Francisco at Mom’s Body Shop. I happened to be wearing a Mom’s T-shirt because I got my one and only tattoo there (a fir sprig—upper right bicep). I accused Susanna of making it up. 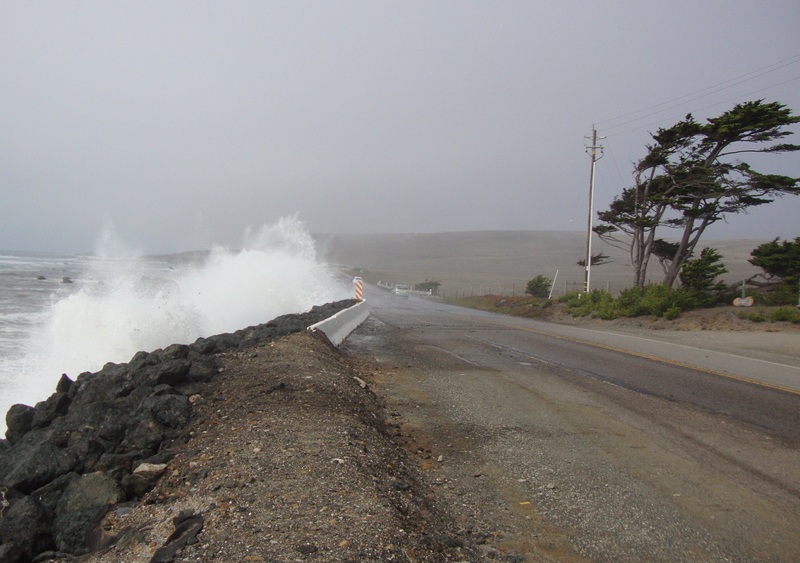 Waves crashing over Route 1. Segue. 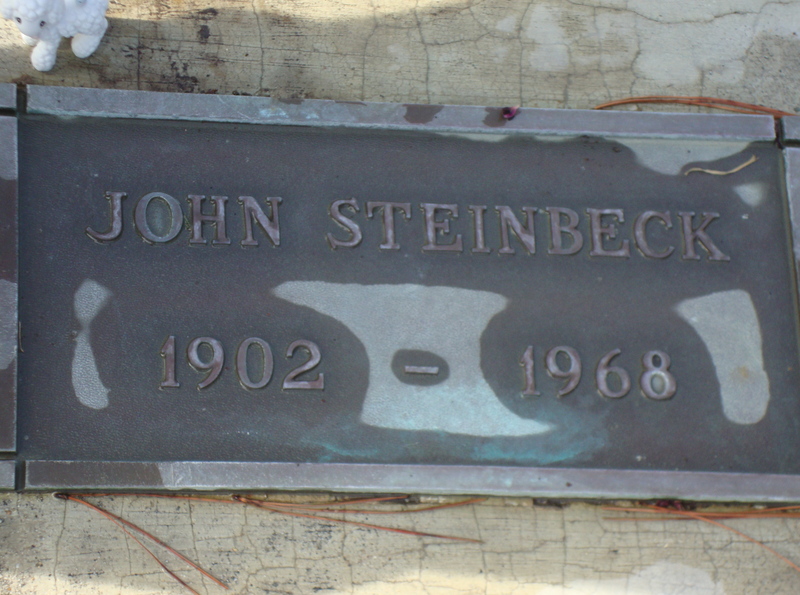 Thomas Steinbeck spent a leisurely hour and a half with me in Santa Barbara, outside a cafe under the trees. Thomas was kind enough to give me a copy of his first book, Down to a Soundless Sea which captures some of his “native relatives” intriguing stories about early life along the rugged and beautiful central California coast. 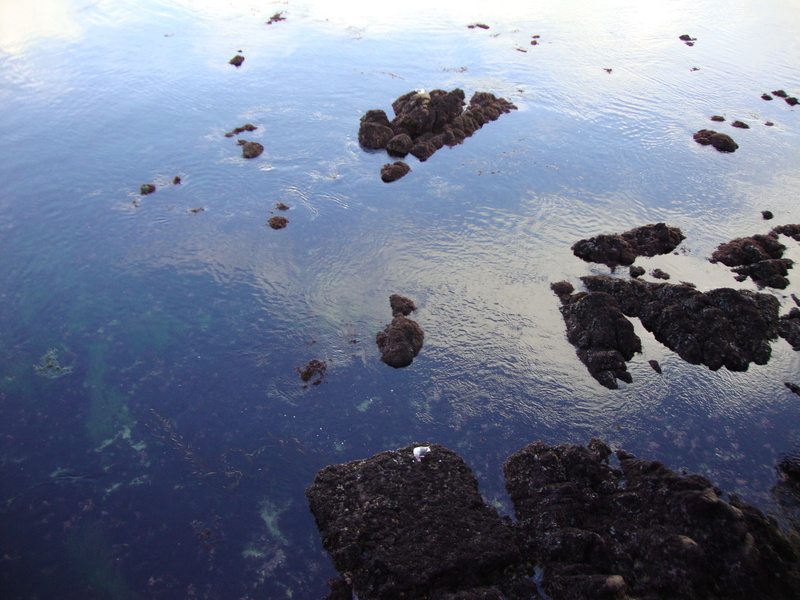 The first in the collection is entitled “The Night Guide” and recounts the saga of Bill Post moving his expectant wife, Anselma from Monterey to a piece of land bordering Soberanes Creek in Big Sur. 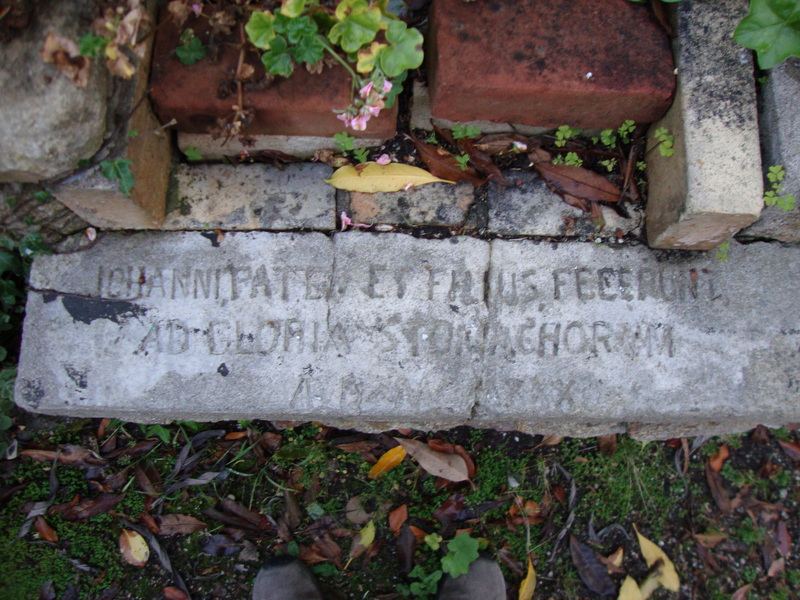 That was in late February of 1859 in the midst of some of the worst storms to pound the California coast that century. Bill’s son, Charles Francis Post (Frank) was, “the first child born in the high Sur under the American flag.” In the magical Big Sur, I met the granddaughter of the first child born in Jackson Hole, where I live, and the next day I met John Steinbeck’s son, Thomas who has written a story of the first child born in the Big Sur. I find connections of that sort remarkable. Thomas looks like his dad. And like his dad, is a raconteur. One only has to read a page of his work to see Thomas loves words and knows how to use them. He is neither overly modest about his heritage nor smug about it. He treats his patrilineage, as all things, with humor. He has fond memories of his father and feels for a person who really just wanted to write and who was backed reluctantly into fatherhood, John Steinbeck was a pretty good dad. Thomas asked to meet Max and pronounced him, and my rig, right for the journey. He said, quoting his father, “you don’t take a trip, a trip takes you.” It is about the experience not the vehicle. It was an honor to meet Thomas. Sweet Notes: Mary in San Diego. Thanks so much for all of your help over the last few weeks. And thanks for riding along and becoming a fan of the Travels with Steinbeck Facebook page. 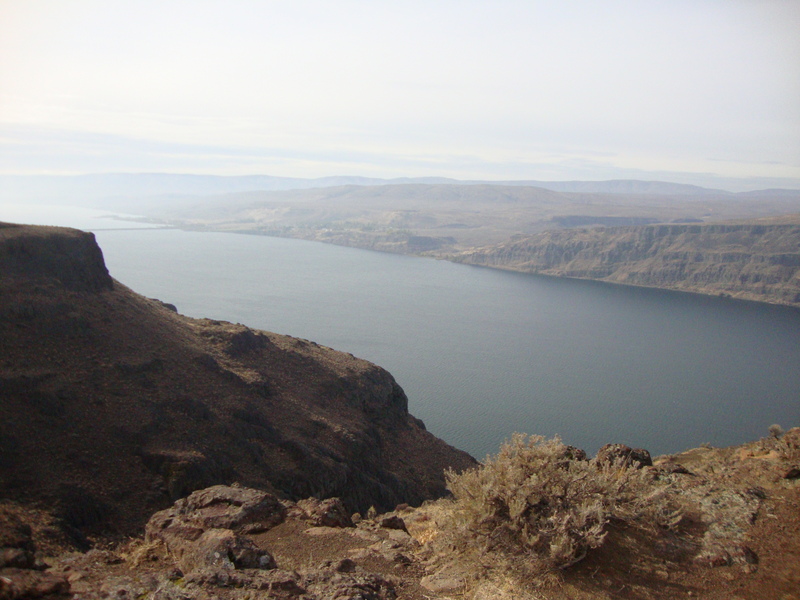 The Columbia River near Ellensburg in eastern Washington. Steinbeck’s route: Given the time of year and the likelihood of snow in the Cascades, Steinbeck might have chosen U.S. 10 to go from Spokane to Seattle. It followed the same route past Moses Lake as I-90 does today. From Seattle to Portland it was likely Steinbeck followed U.S. 101, down the coast. The Landscape and Itinerary: I’ve been a slave to the interstate system and a too-tight schedule for several days now, following I-90 across Washington to Kirkland, a suburb of Planet Seattle. Crazy I-5 was my home yesterday heading south from Seattle in a downpour. I spoke at Lakeview Elementary in Kirkland on Thursday and at the Gardner School in Vancouver, Washington on Friday. I spent Friday night in Salem, Oregon and will be back on 5 today heading south again. Still, I saw an amazing chunk of this immense country from the interstates. In Western Montana I-90 follows precipitous canyons with steep conifer covered slopes. It crosses the sinuous Clark’s Fork River several times. Then the piece de resistance is the final climb to Lookout Pass and the Montana/Idaho border. I had been warned by an elderly woman in Hardin, Mountain about this pass in a way that felt a bit spooky (bony finger point, scratchy-wavering voice, parting blessing) and I was grateful that it was a few degrees above freezing when I (literally) dropped into Idaho mountain and mining country. Snow or freezing rain would have been bad, “veeerrry baaaaad” (scratchy voice). Snoqualmie Pass in the Cascades near Seattle is every bit as beautiful as Lookout Pass and even displayed some lovely fall colors. The weather cleared and a startling Mt. Hood was visible to the East when I crossed the Columbia River at Portland. My Airstream Bambi performed beautifully, tracking my Toyota 4Runner up and down passes and through downpours as if they were one unit. 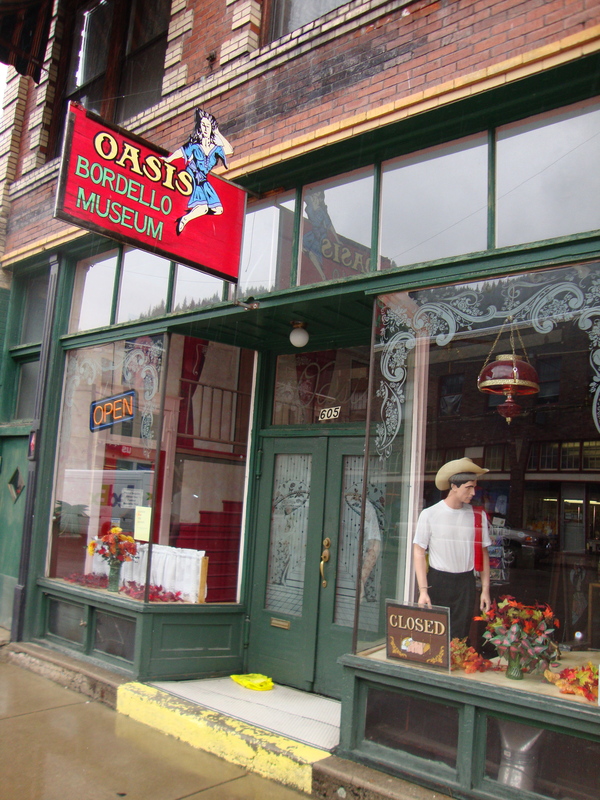 The Oasis Bordello Museum of Wallace, Idaho was closed for the season. The Steinbeck Connection: Charley and his traveling companion John Steinbeck were ostensibly driven out of Yellowstone by bears. But Steinbeck didn’t really want to go in the first place. “I am in love with Montana,” he wrote in Travels with Charley. Yet he expressed disdain for national parks, declaring that Yellowstone was “no more representative of America than is Disneyland.” Ultimately, Steinbeck went, only because he feared his neighbors would think him crazy for passing on the archetype of American natural wonders. Charley went nuts when bears approached the truck. Steinbeck left Yellowstone immediately and spent the night in Livingston, Montana—his loss as well as ours. Charley got sick as the two neared Washington. The inept alcoholic vet that treated Charley in Spokane is what Steinbeck captured from that area in Travels with Charley. I had the pleasure of a brief stop in Wallace, Idaho and a stopover with friends in Spokane. Wallace is a true western town with a quirky past tucked up against the slopes of the mountains. It is still producing silver toady. Being a lover of culture and history, I was disappointed to find the Oasis Bordello Museum closed for the season (sign in window, “Inquire about our Bordello Tours”) but was lucky enough to catch a delicious lunch at the spacious and wildly decorated 1313 Saloon. It was named when it was established many years ago for being the 13th saloon and brothel in Wallace. You could say, Wallace is part of the “other Idaho.” No mention of potatoes or Mormons in Wallace. Spokane is a very pleasant medium-sized city with little traffic, tree-covered neighborhoods and city parks, all four seasons, great medical services and colleges, and outdoor activities. It is the largest city between Minneapolis and Seattle, but still has a small town feel. Kirkland, Washington had a similar feel. The maple and oak trees in fall color, complimented by banana trees and rose bushes, still in bloom, were glorious. I discovered a yellow rose above a sidewalk that was at nose height, not even requiring bending to stop and smell. 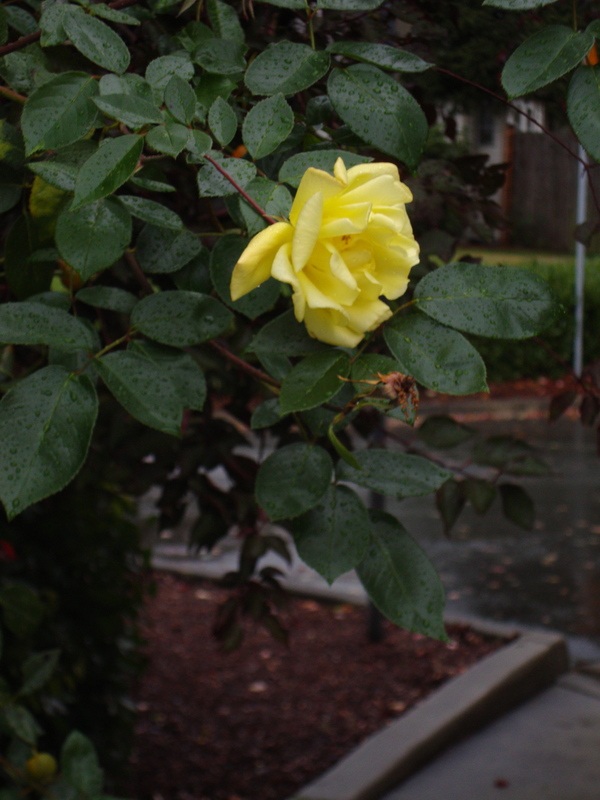 A rose at nose height in Kirkland, Washington. Sweet Notes: My friends John and Margret in Spokane, and Harriette and Alex in Kirkland put me up and wined and dined me so very well. I’m grateful for your friendship and to have you riding along. Montana mountain pass near Livingston. The Landscape: Okay, perhaps I have been treating neighboring Montana like the proverbial neighbor’s wife who is gorgeous and it’s unseemly to covet, so she is ignored. One can’t ignore Montana while driving across her, and she is lovely. Yesterday’s light was unlike any I have ever experienced. It was as if it had texture, a golden viscosity like looking at things through amber. Every object stood out distinct from the next. Typically, Montana displays a scene, of which, any western state would be proud—of fertile fields undulating up to tree-covered slopes capped by snowy mountains. But then Montana throws in a meandering stream, a few picturesque cattle, a train laboring up the valley, and an even taller and cloud covered distant peak—all as accessories. Are there flaws? Of course, Butte is a scar and there are way too many tacky casinos. The Steinbeck Connection: While lingering in Billings Steinbeck bought a cowboy hat he refers to as a “stockmen’s hat” in a letter home. Although that term doesn’t seem to apply to any style today, I described the narrow brim look to Sal at Last Stand Western Wear in Hardin, Montana and she promised to order it for me and send it. That is in a week or two after she “cooked at the prison and shipped some cattle.” I commented as I walked out that I hadn’t given her any money. “That’s how we do things here, but there is one thing you can do for me. You can send me a copy of The Grapes of Wrath, I’ve always loved it.” Sal, if you are reading this, your book has already been ordered. But then, all I have to do is blog and drive. A tacky touch of the tropics near one of many Montana casinos. Profile: In Hardin, I was looking for the breakfast place where locals hang out. As I entered the Lariat Country Kitchen I saw a bumper sticker on an older long bed pickup that said, “Only The Dummer Vote OBummer.” I want to talk to that guy, I thought, and sure enough, I did. Tom Conroy is a warm, articulate older gentleman now retired from ranching and politics. He had four terms as a state legislator until, “the liberals moved in from California and the governor at the time pushed me out.” Tom was wearing a black cowboy hat and black vest and jeans. 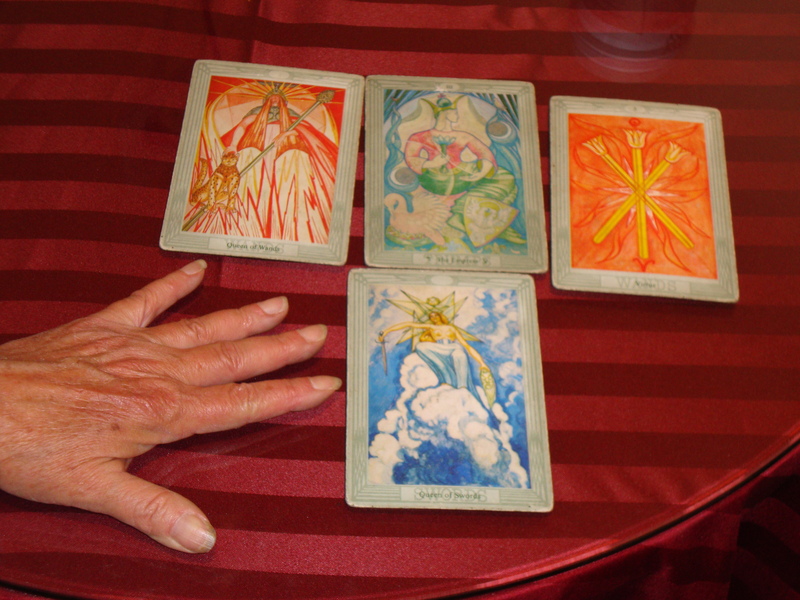 He appeared to be nearing 80 years of age. He is a weathered handsome man with a dry sense of humor and a love of history. “Come to my ranch in the Pryor Mountains (near Billings) in the summer and we’ll talk history,” he said. His wife Colleen died from breast cancer ten years ago. She had a grandfather who was Crow Indian and started a magazine called “American Indian Journal” aided by cowboy author Will James. The grandfather even sold James some of his property in the Pryor Mountains. A billionaire now owns the property, Tom said. Tom feels “the current administration is the worst thing to happen to America since 9/11/01 and we may never recover.” I accepted Tom’s kind invitation to visit his ranch next June. With any luck we can hold the conversation to our mutual love of birds and animals and western history, and steer away from politics. Max fits perfectly under the Bambi's comfortable table (Bob loves it too). The Dog: I realized when I walk Max in crowded campgrounds, which are often filled with dogs, especially the type that can fit in the ashtray of large motor homes, I keep my thumb on the brake of the expando-leash in case I have to throw the brakes on a sudden charge at another dog. Sweet Notes: My sister Jeanne has been virtually riding along, but now she plans to ride along for real—across Texas. This feels right because Steinbeck visited his sisters in Monterey, and Elaine was with him for a long stint in Texas. It will be great to have my Sis ride along. The Badlands look pretty good in the early morning decked out in snow. Steinbeck’s Route: It’s anybody’s guess how Steinbeck got out of Chicago—even in 1960 there were many choices. My guess is—U.S. 14 to Madison, Wisconsin and U.S. 12 to Mauston, Wisconsin where he stayed. U.S. 12 would have taken him to the Twin Cities. He most certainly followed U.S. 52 to Sauk Centre and U.S. 71 and U.S. 10 to Detroit Lakes where he spent the night. In 1960 U.S 10 ran all the way across North Dakota from Fargo to Beach and was also the main southern route across Montana. Today it has been replaced by I-94 and I-90 (my route). The Landscape: There was little to engage the eye in North Dakota. In fact, when the rather flat terrain redolent with brown-on-brown flowing to a brown horizon was interrupted by the occasional camel’s hump hill, it was adorned with a huge cutout of a cow or antique farm equipment. The Badlands to the west around the Little Missouri River splashed in some pink and blue for welcome variety. I think the Badlands look rather good with a dusting of fresh snow, as was present when Max and I woke up in Teddy Roosevelt National Park Monday morning, October 12th. What story lies behind these discarded items in Western North Dakota? I felt most of my creepy aloneness in Wisconsin just after saying goodbye to my wife, Dimmie, while camped in dense woods far away from anything and anyone, except for one canvas tent full of strange men. I caught myself thinking sinister thoughts about them. But, I was cheered that night by an envelope of grateful and supportive notes from a class of ninth graders I visited with in Carlisle, Pennsylvania. I thought the Badlands of North Dakota looked good in snow. It was important to learn I could rise to the early morning challenge of driving in snow, pulling the Winnie. I visited The Little Bighorn Battlefield—it was a powerful and chilling experience. And as for Montana, although not without its flaws, it is spectacular for sure; I could fall in love with Montana but then I would be cheating on Wyoming. Eastern Montana lawn art. Rocinante, is that you? The Dog: My buddy Dave sent a comment that Max seems to be getting younger on this trip, and it is true. Max has been a wonderful companion. I have never felt closer to him. He seems to be recovering nicely from the botched tick removal the other day and has forgiven me my clumsiness. Sweet Notes: My old friend, Clint, just called and gave me some feedback on my blog. He closed with, “If you get in trouble anywhere within 300 miles of here call me and I’ll be up from Idaho to help.” Now that’s sweet, and it’s great to know Clint is riding along. I also heard from Marilyn who wrote, “I love seeing this ‘monster land’ with you and Max while sipping my morning coffee at the dining room table before going to work.” Thanks for riding along Marilyn. Last Stand Hill from the perspective of a charging Sioux warrior. Itinerary: I followed I-90 for a ways and got around the Twin Cities megalopolis with relative ease and, with the help of GPS lady (still haven’t settled on a name—Betty, maybe.) At Sauk Centre I opted for the two-lanes again, and followed U.S. 71 to U.S. 10 and on to Detroit Lakes. Betty insists on a street address in order to guide me to towns and cities. I satisfy her by making one up. I generally choose “1200 Main Street” because just about every town has one. I got particular pleasure out of punching in “Main Street” in Sauk Centre, Minnesota, Sinclair Lewis’s boyhood home. Only a lit-geek would think that was cool. If you are one, then you know why. Old rides beneath new in Minnesota. The Landscape: Funny, I had this persistent image of Wisconsin being a pretty, smart, popular girl and Minnesota being her rugged, hard-working, but comparatively plain brother. Then I reread Steinbeck’s description of Wisconsin in Travels with Charley this morning and was reminded that he had compared Wisconsin to what we would call today, a “high maintenance” woman. “But this fact does not make her less lovely—if you can afford her,” Steinbeck wrote. 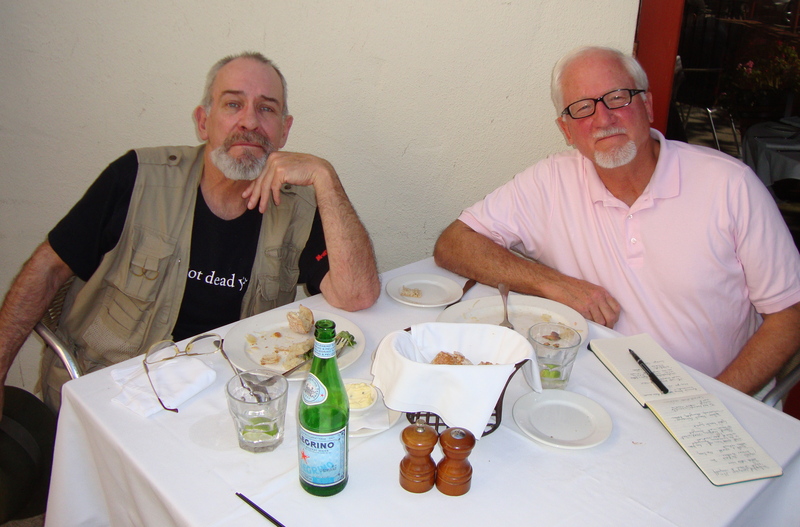 The Steinbeck Connection: I have followed my vagabond mentor’s lead over the last five weeks. Mine is an act of, lets be honest, imitation. It is a pilgrimage fueled by admiration, firm but not fanatical. At rare times I feel I may have improved slightly on what JS did, or what he observed. But yesterday, I did something important for him. Something he was not able to do 49 years ago. The drive from Mauston, Wisconsin to Detroit Lakes, Minnesota is long under the best of circumstances. Add to that four hours of being lost in Minneapolis/St. Paul, as was reported by Steinbeck and you have what I would call a driving day from hell. Since the author arrived late to Sauk Centre, Minnesota, he kept going to his destination (Detroit Lakes) and did not have a chance to enjoy the birthplace of his friend, Sinclair Lewis. I did. Display from the Sinclair Lewis Interpretive Center. 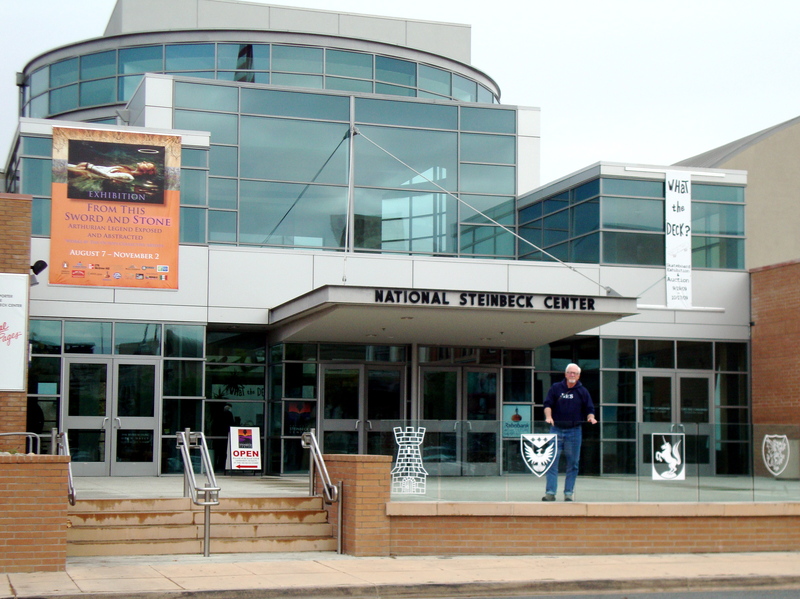 Center (and Chamber of Commerce) was a comfortable building staffed by friendly people. The Lewis exhibit was attractive, informative and free. Sure, it had the odd manikin in period dress performing no apparent function, but, for a small town, this is a good exhibit, well-maintained. I learned a lot. “I had read Main Street when I was in high school, and I remember the violent hatred it aroused in the countyside of his nativity.” Travels with Charley. Judging by the tribute to Lewis in the interpretative center, I’d say they got over it. Steinbeck mentioned in one of his letters home that all the talk in this area was, not about politics, but baseball. I have heard two conversations in the last 24 hours on that most beloved of Americans preoccupations—one in Wisconsin, a men’s coffee klatch at breakfast, and one in Detroit Lakes, two gals who work the early shift at the lodge where I’m staying. Of course, it doesn’t hurt that the Minnesota Twins are playing the New York Yankees in the division playoffs. The Dog: Had to perform a tickectomy on Max’s head this morning. I pinned him inside my jacket in order to tweezer him. He was not happy. Late for ticks. Sweet Notes: I pulled into Detroit Lakes with a front blowing in across the Plains—snow, black ice and freezing temperatures. I hunkered down at The Lodge on Detroit Lake and discovered the best combination of view, accommodations and service for the dollar that I have encountered in 6,000 miles. Peggy and Kathy at the front desk could not be nicer and more helpful. The Lodge is the only place I have ever stayed that offers in-room recycling. They also have environmentally friendly BeeKind Products and packaging by Gilchrist and Soames. Cathy and Peggy have promised to ride along. The Bambi named Winnie gets cold feet. Steinbeck’s route: My best guess Steinbeck took U.S. 12 to Mauston, Wisconsin. In a letter dated October 10, 1960 to Elaine Steinbeck, he refers to being camped near a place called Manston, Wisconsin “about halfway between Chicago and Minneapolis.” He mentions that “Manston” is beyond the Wisconsin Dells. “Manston” must be a typographical error (flip the “n” in Manston and you have Mauston. Mauston is the only town (then and now) that fits the description. Wooded island in the Wisconsin River. Itinerary: I floated up State 251 in a rainstorm and reconnected with I-90 close to the Wisconsin border. I-90 took me out of the pounding rain and all the way to Mauston, Wisconsin where I followed State 58 to Buckhorn State Park on the Wisconsin River. Steinbeck was very taken by the beauty of Wisconsin, as was I. And I agree that it is the combination of features that he describes that defines it. I have one observation to add. It may be the states that preserve woodlots next to highways that create the most pleasant impression. Certainly, not all of Wisconsin is wooded along the highways, but much of it is. And woods line streams and rivers as well. In that respect Wisconsin reminded me of Vermont and Northern Maine—sylvan glory. The Steinbeck Connection: I was very moved by the last paragraph from John’s letter to Elaine written in Mauston, Wisconsin and I think it bears repeating here without comment. He leads up to the last paragraph telling his wife that he plans to angle up to Fargo, North Dakota for reasons that are, he admits, silly. Then he says maybe this whole trip is just as silly. Of course, one of the reasons for it must have occurred to you—I nearly told you that one in Chicago. American men of a certain age are very likely to get the George Albee disease. They become habitual sick men. After my illness (a likely stroke nine months earlier) I had every chance to develop this state….If this trip does nothing else, it will remove the possibility of that trouble. You see, I can read a map. I can drive a truck. I can make do. And I can stand the loneliness as you can. There it is. It is an antidote for a poison that gets into very many men of my age and makes them emotional and spiritual cripples. But we’re not going to have that are we? I’m still a man damn it. This may seem silly but to me it isn’t. I’ve seen the creeping sickifying creep up on too many. But you married a man and I’m damn well going to keep him that way. That’s all for tonight. I love you. The Dog: Max looked spiffy after his stay and grooming at the Airport Pet Lodge. We found a little beach by the Wisconsin River last evening and he bounded up and down the sand several times. Max (with new 'do) bounding up and down the beach by Wisconsin River. Sweet Notes: I was afraid I was going to leave the Ambassador East Hotel without a single significant conversation until I met Erroll outside the hotel. Erroll Johnson drives an airport shuttle and he looks and sounds like Morgan Freeman. He is tall, wears shiny shades and a warm smile. “I should call Morgan’s bank and make a withdrawal, he said.” When he heard I was from Wyoming he asked if I knew his “homeboy” Harrison Ford. I told him I had met Harrison—one degree of separation. Erroll has driven Ford, who was born in Chicago, to the airport many times. Errol has had invitations from folks all over the world to visit their homes, as well as accolades sent to Mayor Daley about his sense of customer service. He says he would trade places with Freeman but he wouldn’t want to do “Shawshank Redemption.” He visited prison once for four hours and says he doesn’t want to go there. “Those guys are all innocent. They say they caught a case like they say they caught a cold.” Erroll said “good morning” to everyone who walked by, even if they had ear buds in. When I gave Erroll my card, he promised to ride along. And to you wonderful students in 9th Grade Honors English at Cumberland Valley School in Mechanicsburg, PA. I loved your notes. Thanks for riding along. Pumpkin at the Airport Pet Lodge. Itinerary: After a short-two lane journey on rural U.S. 20 to pretty much knock off Northern Ohio, I followed I-90 to Chicago. The tolls and traffic were terrible! Steinbeck’s route: This will require more research on my part. There is reason to believe he went straight on I-20 (today’s I-90) and also evidence that Steinbeck detoured up into Michigan. More on that later. Regardless of the route,we both had the same strong motivation, seeing our wives after several weeks. And the same destination, the Ambassador East Hotel on North State Parkway. Steinbeck got lost trying to find the hotel—we couldn’t find it with a GPS and finally had to knock on a door and ask for help. The Landscape: What can you say about Indiana, oh, that it has great colleges and universities. 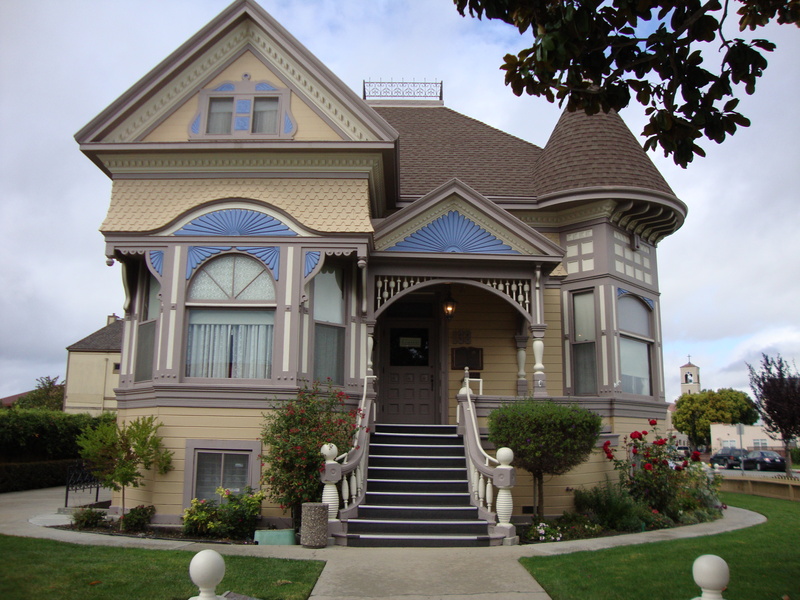 The Steinbeck Connection: The main connection is, of course, the Ambassador East. Steinbeck describes it in TWC as an “elegant and expensive pleasure dome” where he was well-known. According to Historic Hotels of America, The Ambassador East was built in 1926 and it’s “world famous” Pump Room Restaurant is the place to be seen in the “prestigious Gold Coast” region of Chicago. I found the Pump Room to be full of itself and its celebrity photos (of which there are 725—couldn’t find Steinbeck), but empty of charm and people. The staff, was for the most part, jaded. The Pump Room is also outrageously expensive at twenty-five bucks for a glass of wine and a drink. The service in the hotel was poor requiring three requests to get foam pillows. We went exploring and found our “peeps” at Butch McGuire’s Tavern and Grill where three drinks, dinner, lots of laughs and a ball game on TV could be had for fifty bucks. An "elegant and expensive pleasure dome." I will admit the room was nicely appointed and quiet at the AE, and there Dimmie and I danced to music on the radio and did that other wonderful thing loving couples do after an extended time apart, but I’m going to draw the curtain on that act. The Dog: Max overdid it a bit when we first arrived. I had left the door of the trailer open with him inside. He never goes down the step without help. When a boy came too close walking his medium-sized brown dog on a leash, Max dove, superman-style out the door, ready to engage. I jumped out onto the lawn in my socks and danced around on one foot trying to keep Max away from the visitor with my other. The boy was being turned in circles by his dog who was seeking a piece of Max. I finally got Max by the tail while his antagonist was dragged off snarling and snapping. The next day Max was moving kinda slow and favoring one leg. I got a baby aspirin down him cloaked in Swiss cheese and dropped him at the Airport Pet Lodge were we had booked him a suite, a grooming and hopefully a good rest. Charley was given similar treatment in Chicago. The Ambassador East is filled with interesting nooks and narrow hallways. Sweet Notes: Jeffery, waiter-extraordinaire at Butch McGuire’s was the first person we met in Chicago who got excited about Steinbeck and my journey. He remembered enjoying The Grapes of Wrath, and he plans to ride along. Steinbeck’s route: Somewhere North of Buffalo, Steinbeck tried to cross into Canada to take the northern route above Lake Erie to Detroit. Canadian authorities asked the author if he had a certificate of rabies vaccination for Charley. He did not. He was informed that he would not be allowed to reenter the U.S. with the dog without it. In frustration, he hopped on I-90, which was apparently completed to Madison, Ohio and then I-20 (today’s I-90) to Chicago. Oddly enough, he mentions that route taking him into Michigan and, in fact, I-20 did not go through Michigan, it skirted along the top of Indiana. Morning moon over Northwestern Ohio. My Itinerary: I-90 to Cleveland and then Ohio-2 along Lake Erie to Maumee State Park where I camped Northeast of Toledo, Ohio. Four weeks on the road today—5,500 miles. The Landscape: State-2 along Lake Erie, although flat (“flea-at,” a mid-westerner might say), was an unexpected bonus. Bushes and shrubs in autumnal hues tending toward purple and violet, fields of rich brown grasses, produce stands with pumpkins everywhere, and lake views forever. The Steinbeck Connection: “Now I’m about to hit the ragged centers, the Youngstowns and Detroits etc., crawling with production. I can’t avoid them. There they are—right in the way. I only know they make me nervous.” Letter from John Steinbeck to his wife Elaine (September 30, 1960) from the border between New Hampshire and Vermont. They make me nervous too—always have. I grew up a country mouse in Saltsburg, Pennsylvania and have usually lived in small towns or rural areas as an adult. Large “arteries” around cities and my own seem to work in sync, as the urban highways become more chaotic my knuckles whiten and my blood pressure surges. Home away from home. This home was near Niagara Falls. Thinking that perhaps well-meaning (I’m nothing, if not well-meaning) “rubber tramps” such as I, may have their own special guardian angel, I’m pleased to report that thus far, congested urban areas have not been a problem. I seem to be lucking out and hitting them on Sundays (such as Cleveland, yesterday). Of course, I write this on a Monday morning with Chicago dead ahead (gulp). 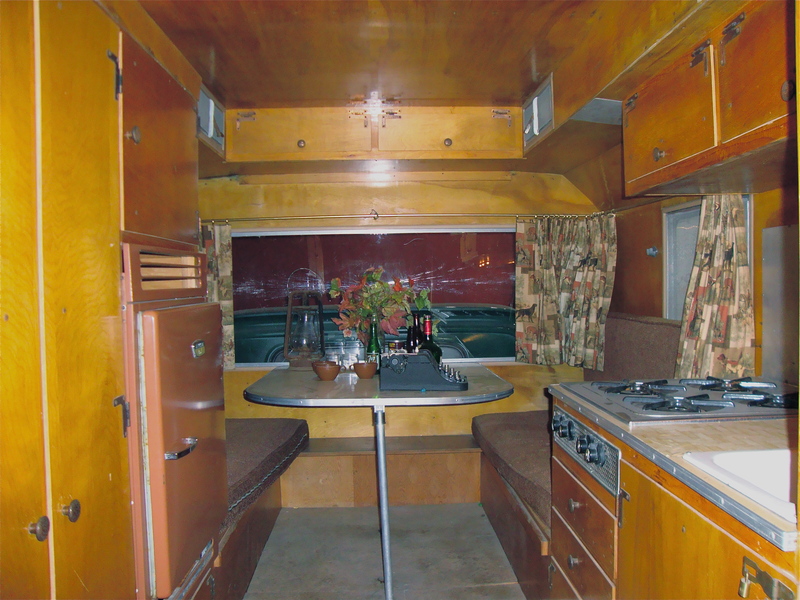 Profile: At the tree-covered and quiet North Niagara Falls KOA, I met Rodney. Rod is a floor manager for a casino in Colorado. 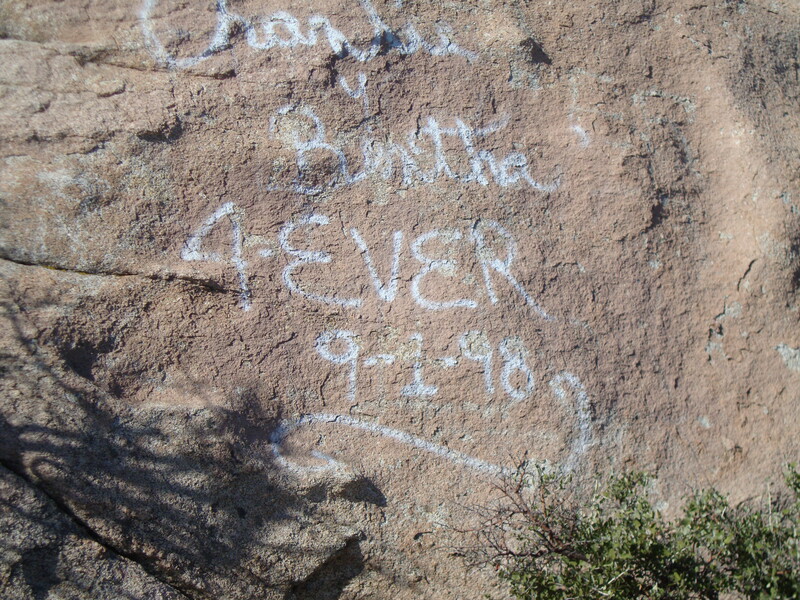 He and wife Donna were just completing a three-week trip and had been to many of the places I had visited. He was not familiar with Steinbeck. When I mentioned Travels with Charley, he said, “Nope, I’m just getting into ‘trailerin’” Then he smiled, and asked me if I was Charley. Later he mentioned dropping out of high school and still having done well, but is adamant that kids must have a good education and computer skills today. When we met, Rodney was walking his male Maltese, Harley, who acts just like Max—love every human, attack every other animal regardless of size. Rodney was chewing tobacco and spitting while we talked, had a goatee, salt and pepper hair, wore glasses and was short in stature. He is 58 years old. He said the economy is strong in his town but that is not a good indication because people gamble more during tough times. “Not that that’s a good thing,” he said glancing up at me. Rodney and Donna joined me in the Winnie for drinks. We laughed a lot and really enjoyed each other’s company. What was striking was how much these two folks who, “have been messing around since we were fourteen,” still enjoy each other. Not a critical word was exchanged between them. Donna has black hair, green eyes and a warm smile. As I mentioned, Rodney is the floor manager for a casino, yet he doesn’t gamble. Sweet Notes: I’ve met many great folks on this trip, Rodney and Donna among them, but as we parted, I felt that this was a couple I would see again. They have promised to ride along. I received a supportive phone call from my friend BJ the other day. Thank you BJ, for the support (I need all I can get) and for riding along.